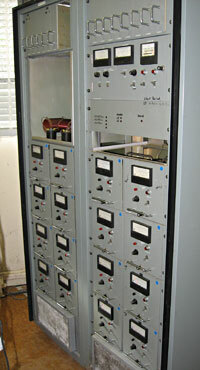 Following the closure of Auckland Radio in 1993, the Musick Point Radio Group obtained the decommissioned transmitters and moved them about three miles to the receiving station at Musick Point. Other transmitters have since been added to the collection. 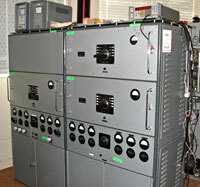 Some of the transmitters have been restored by MPRG members and given a new lease of life in the amateur radio bands. Other transmitters will be restored when time and funds permit. Click on the photos for more information about each transmitter. 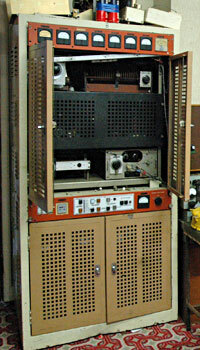 This solid-state Canadian-built transmitter was used at Auckland Radio ZLD until the station closed in 1993. Its modular design allows power supply or power amplifier modules to be removed for servicing while the transmitter remains on the air. Status: Was used on 512 kHz at ZL1ZLD, but following a change to amateur radio frequencies was retuned to the 630m band (472-429 kHz). The modulator was removed so the mode is A1 CW only. Servo switching of the 6 channels. Similar to the above but with relay switching for the two channels. Commonly referred to as “1301” (its serial number) by the volunteers at Musick Point. 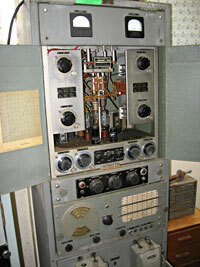 This transmitter was at the station in the early 1950s. It was the standby transmitter for the island services. We have brought it into operation after a search for final tubes, the original ones having lost all their emission. All wiring has been thoroughly checked and found to be intact. The transmitter normally ran on a fixed crystal frequency in the oscillator. This can still be done but has been slightly modified and can now be fed by a variable VFO from the operating console upstairs. The output of this transmitter is fed by coaxial line to the antenna patch panel. When the audio controller (PTT) line is operated, the antenna change over relay takes the TX to “on air” and shorts out the RX position. Therefore the same antenna can be used for one operation. This transmitter will run at 100 watts maximum CW and has a 100 watt carrier on AM. Our Collier and Beale 873 transmitter has a black crackle paint finish, and although this has worn thin over the years it still looks great with all the metering on its facing side. As is common with this type of equipment, there are two sections. Although it is built as one unit the top half is the RF Section and the lower is the power supply unit. The front has a two-door inspection cupboard and the rear door is from top to bottom. 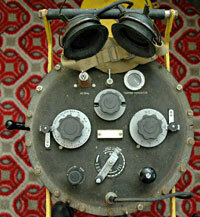 Both of these have safety switches, so the transmitter is rendered safe whilst tinkering with the engine so to speak. The output has been altered from a twin feeder or 600d line to coaxial and this also goes to the antenna patch panel. This gives more flexibility. 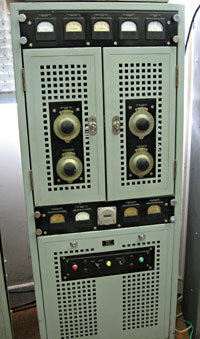 This transmitter appears to be identical to the Collier and Beale 873, apart from minor cosmetic differences. It was a later addition to the Musick Point Radio Group’s collection. 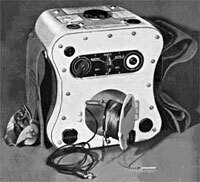 This is a two-set transmitter, or twins, having one power supply but two complete CW transmitters in one package. 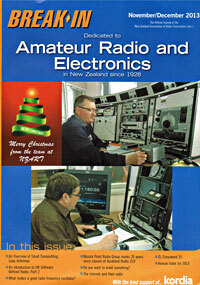 The 666 transmitter was used by the New Zealand Post Office for 500 kHz CW. It was later modified for the AM broadcast band. 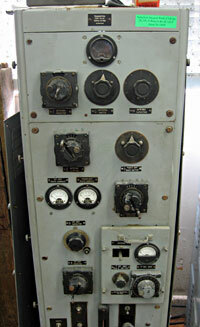 This New Zealand-built transmitter was used at sea and includes its own dynamotor generator. 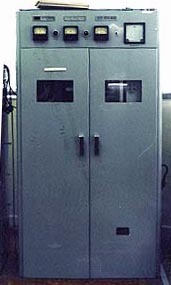 At the time of its closure in 1993, Auckland Radio ZLD had a late model Harris single sideband transmitter, which was sold.